Striker Glenn Murray has been backed to continue scoring goals for Brighton & Hove Albion after signing a one-year contract extension. 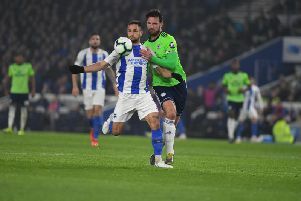 The 35-year-old is the club’s leading goalscorer, having scored six times this season, and reached 100 goals for Albion with his most recent strike against Wolverhampton Wanderers. The evergreen front man's Seagulls contract will now extend to the end of the end 2019/20 season. Albion manager Chris Hughton said, “We are delighted to have extended Glenn’s contract. He has proved a vital member of the team and his goals have been crucial to us. “Glenn has scored consistently for us, first in helping us win promotion, and now in the Premier League as we seek to establish ourselves at the top level. “He’s proved himself at the very top late in his career, and his professionalism and approach on and off the pitch is a big factor in why he’s still doing it now. Murray’s career has seen him rise from non-league football to the top flight, having played for Workington Reds, Wilmington Hammerheads in the US, Barrow and Carlisle United in the Conference. He then played for Stockport County, and he first joined Albion in 2008, when Dean Wilkins signed him from Rochdale. During that first spell he helped Albion win the League One title in 2011, before departing that summer. He returned to the club in 2016, having played for Crystal Palace, Reading and AFC Bournemouth, and scored 23 goals in his first season back as the club won promotion to the Premier League. He hit 14 goals in Albion’s first-ever Premier League season, and his six goals this season took him to 100 goals and made him the club’s post-war record goalscorer, and leaves him 23 shy of all-time scorer Tommy Cook.